To put it mildly, The Avengers was an absolute phenomenon. Film critics (and fans) can debate for hours about what the greatest superhero movie ever is (for my money, it's The Dark Knight), but certainly Avengers was the biggest, most successful superhero movie to ever come out (right up until the release of Avengers: Infinity War). It was huge, smashing the box office and launching the Marvel Cinematic UniverseWhen it first began in 2008 with a little film called Iron Man no one suspected the empire that would follow. Superhero movies in the past, especially those not featuring either Batman or Superman, were usually terrible. And yet, Iron Man would lead to a long series of successful films, launching the most successful cinema brand in history: the Marvel Cinematic Universe..
What's interesting, though, is that after Avengers came out, the MCU fell silent for a year. It's hard to say just why this was, especially when in 2018 we're used to three MCU titles a year, regardless of what even movie just came out. Whatever Marvel's reason, after Avengers landed in theaters in May 2012, we had to wait a full year for a return to the MCU. And that return happened, naturally enough, with the MCU central character, Robert Downey, Jr.'s Tony Stark/Iron Man. Whatever your thoughts on Iron Man 3, and we'll get to mine in just a moment, it's hard to argue with Marvel's strategy here (planned or not). Because of the wait between films, audiences were chomping at the bit to go back into the MCU. We were primed, and Iron Man 3 rode that to become one of the biggest films in the MCU (fifth, after the three Avengers films and recent cultural smash, Black Panther). The film was released at the right time, a good film that became almost as big a hit on its own as the giant crossover film that preceded it. In the film, Tony Stark is still reeling from the events at the end of The Avengers (you know, flying a nuke into a wormhole and almost dying). He's suffering PTSD from it, unable to sleep and, thus, always tinkering on new versions of his suit. At the opening of the film he's just put the finishing touches on his Mark 42 suit (implying 41 previous versions, most of which we've never seen before), and struggling to stay centered. However, a new terrorist threat has come out of the shadows, a man named the Mandarin, and his attacks on Americans (and American soil), bring Tony out of seclusion. But there's more to the Mandarin and his army of followers than even Tony can predict. The conspiracy, too, goes deeper and deeper, and Tony will have to do this digging with limited resources once the Mandarin blows up Tony's house (with Tony in it). Without a lot of time, and having to work alone, Tony has to get to the bottom of the mystery, find out who the Mandarin is, and stop him. 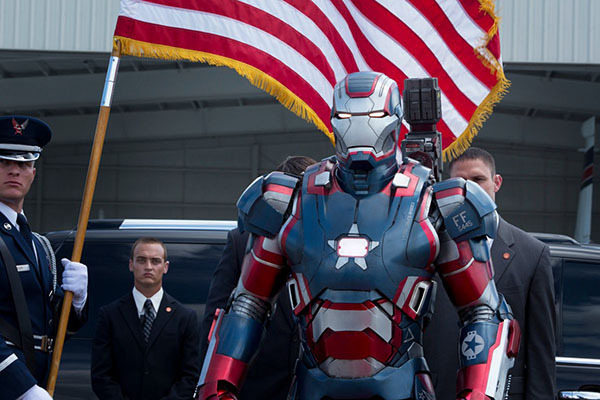 As much as it sounds like there's a lot going on in the film, Iron Man 3 handles its plot deftly and with a light touch. Much of that credit deserved goes to writer/director Shane Black, who handles setting up all the pieces, and moving everything forward, in a solid, engaging way. An opening scene in Switzerland, 1999, sets up a lot of the players (with a nice call back to the first film), but the movie wisely keeps much of the focus on Tony, using him as the through-line for the mystery of the Mandarin. Let's be frank about this, the Mandarin is the weakest part of the film. Rightly, people complained about the white-washing of the character, having Sir Ben Kingsley play what should be, ostensibly, an Asian character. Of course, the Mandarin was a racist caricature of a character in the old comics -- sure, he might have been one of Iron Man's biggest foes back in the day, but it's hard to do anything with a character that is, to put it as nicely as possible, a "yellow peril" bugaboo. The fact that Marvel decided to move forward with the Mandarin as a character at all is questionable, and while the film tries to distance itself from the past versions of the character, creating something different (that could be played wonderfully by Ben Kingsley), I have to wonder if it would have been better just to use any other character instead for the part. Honestly, if the film has any real weakness, it's that none of the villains included in it are all that interesting. 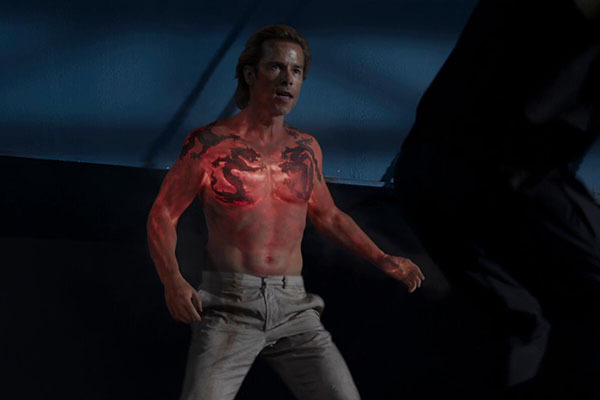 The Mandarin is the face of Iron Man 3, but he's not the only villain, as we also have a shady industrialist (Aldrich Killian, played by Guy Pearce) and a bunch of his goons. Killian is the most interesting foe in the film, and even he's sidelined for much of the piece. Were he given more time, and more of a connection to Tony, he might have been a bigger force. As it stands, the time the film has to devote to its antagonists is split between, essentially, five different focuses (counting all the goons and side-players), meaning none of them really rise to be the central force of the film. That leaves all the weight of the film, then, to ride on Tony's shoulders. Thankfully, this is where the movie really comes together. 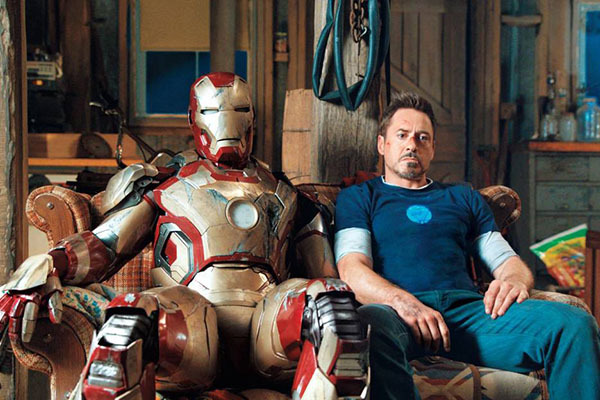 I guess it's not a surprise to say that Iron Man is the best part of an Iron Man film, but Tony really does take center stage here, played masterfully once again by Robert Downey, Jr. The character's snark and wit is on full display, especially in sections like the Tennessee-set middle act. Here, Tony ends up with a kid sidekick, and somehow the film manages to make that nowhere near as annoying as it should have been. The two trade barbs and banter as Tony works to solve the mystery of the Mandarin on the down-low. This is, probably, the best part section of the film, a deftly constructed set of scenes that strip Tony from his suit and force him to be the smartest, snarkiest man in the room without any of his gadgets. It's really once of the smartest things the movie does: it shows us Tony with all his suits, all his gear, but suffering from deep trauma, and it then strips away all of his tech to give us the raw man beneath. Only then does Tony find a way to rebuild himself before he can have his suits back. He comes out the film stronger, less reliant on his tech -- he earns back the right to use the suit and, in the process, realizes he doesn't need it in the end to be a hero. And all of this -- the banter as well as the deep, emotional trauma -- it brought to life via Downey, Jr.'s best performance as Tony in the entire MCU. And yet, the movie pulls out a great twist, not only giving Tony back his suit, but giving him back all of them. 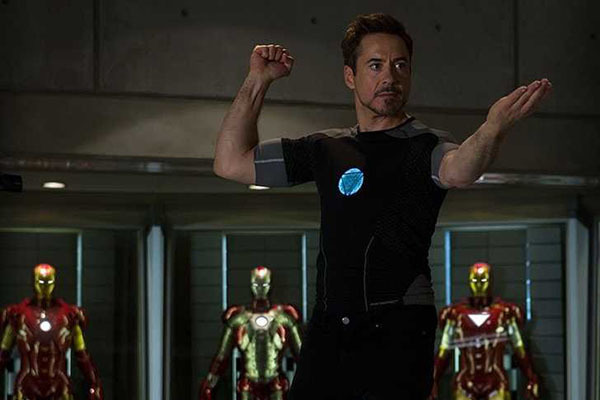 Watching the sequence, with all of Tony's various armors flying around, taking out targets, it explosive and awesome. So as a battle with the the villain it falls short, but as a climax to Tony's own journey, as a way to give him his reward for rebuilding himself, the sequence pays off like gang busters. So yeah, Iron Man 3 is flawed. There's so much that works about the film, rooted by a great central performance, that you largely don't care much about the weak villains or half-assed final battle. 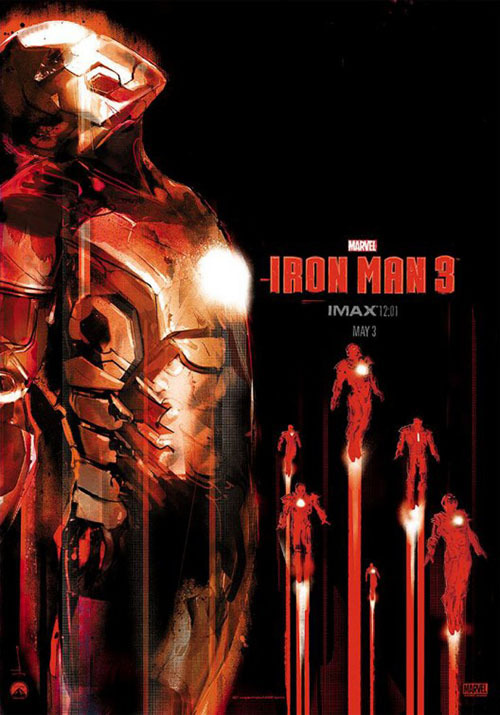 The film is enjoyable, but also emotional, and as a conclusion to the main series of Iron Man films (the character continues through the MCU but never has another solo outing) it works as a great end note. Maybe it's not the best MCU film, but it it's still pretty high on the list. November 2, 2018: Let's Suit Up!